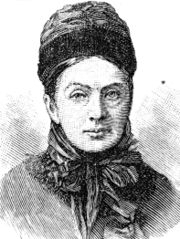 Isabella Lucy Bird was a peripatetic Victorian Englishwoman who travelled around the globe and wrote popular books and magazine articles about her adventures. In 1880, she married Edinburgh physician John Bishop and in 1892, she became the first woman inducted into the Royal Geographical Society. Isabella Lucy Bird is currently considered a "single author." If one or more works are by a distinct, homonymous authors, go ahead and split the author. Isabella Lucy Bird is composed of 20 names. You can examine and separate out names.